The first engineering discipline was military engineering — i.e., the design and construction of fortifications and the siege engines necessary to overcome them. Civil engineering is called such to distinguish it from military engineering, and consequently civil engineers work in the service of civil society — i.e., public works, such as roads, bridges, dams, and waterworks or treatment plants. The origins of Civil Engineering date back to Britain in 18th century. However, recognition of civil engineering as a formal program of study and a professional discipline in the United States came much later. The first civil engineering degrees were awarded by Rensselaer Polytechnic Institute (RPI) in 1835. The first Ph.D. in engineering was awarded to J Willard Gibbs by Yale University in 1863. Geographically, RPI was advantageously located in Troy NY, the eastern terminus of the Erie Canal, the northern-most portion of the Hudson River still influenced by ocean tides, and proximate to the Military Academy at West Point, where military engineering was already established as a program of study. The economic and social success of the Erie Canal had enormous consequences for the development of civil engineering as a profession, the expansion of powers of central government authorities, and the ascendance of New York City to the position it now enjoys as the financial center of the Western Hemisphere. Engineering became a licensed profession in the early 20th century. As then, licenses to practice engineering are now granted by the individual states. Requirements vary between states (as they do for driver’s licenses), but in general license applications are acted upon by a State Board of Professional Engineers who judge the qualifications of individual applicants. Some combination of education (typically from an ABET accredited program) and practical design experience is required to be eligible for licensure. Additionally, applicants are required to pass two exams: the Fundamentals of Engineering (FE) Exam (typically first attempted in the senior year of an undergraduate engineering program), and the Principles and Practice of Engineering Exam. The argument for licensing usually hinges upon protection of public safety, as incompetent engineers might put the public at serious risk. However, one additional practical consequence is to create barriers to entry to the profession, thereby increasing market rates that professional engineers may charge, and the increase in prestige that is associated with belonging to a profession. Therefore, professional engineers have an incentive to self-police their own ranks. Failing to punish “bad apples” would put at risk the privileges and subsidies enjoyed by the entire profession. The National Society of Professional Engineers (NSPE) published a Code of Ethics that all engineers are expected to adhere to. Not surprisingly, paramount among the professional obligations of an engineer is the protection of public safety. 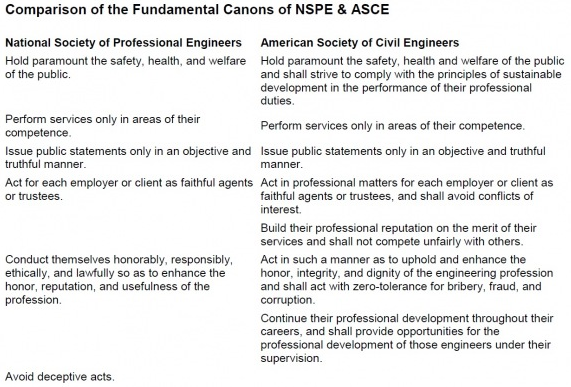 The American Society of Civil Engineers (ASCE) publishes a code that is similar to the NSPE, as do other disciplinary-specific professional societies. Most graduates of engineering education programs never become fully licensed. Rates are highest among Civil Engineers, but even then less than half of all graduates from ABET accredited programs eventually become fully credentialed Professional Engineers (PE). The high rate among civil engineers is likely to due to the fact that many civil engineers are directed funded by government contracts (e.g., for design of public works) that require the work to be performed (or directly supervised) by a PE, who will stamp the design drawings. By contrast, an electrical or computer engineer working on the design of a new microchip may gain no advantage from licensure, since the same requirement does not exist. One of the defining characteristics of a profession is the expectation that practitioners (i.e., professionals) are able to set aside their own individual self-interest, and act for the benefit of others. Professionals are expected to acquire and apply expertise. As a result of having both a higher moral purpose and their expertise, professionals are typically empowered to exercise judgement, which we can understand as the knowledge to act in the absence of rules or guidelines (or when to break those rules). This video from Dr. Michael Loui, from the University of Illinois explores the question, “What is engineering?” and whether engineering is a profession. This entry was posted in Uncategorized on February 5, 2014 by making7.